Ahhh, Netflix. The source of my happiness and procrastination. I’m sure you feel the same. One of the strongest moments of indecision I have had in the past few weeks is choosing a new series or movie to watch when I have down time. It’s like the last show you had was building a solid relationship with you and when it ended, your heart cried a little. You go through the list of recommendations others have given you but you refuse to believe a show could be better than the gem you just watched. You aimlessly scroll past shows that you’ve heard of or have a slight interest in but you just can’t bring yourself to press play unless you know it will make you as hooked as the last show. Your prayers have been answered for those of you who have the same likes as me. I don’t mind fantasy but I need a solid plot line with meaningful plot twists and romance thrown in somehow. As long as that is present in a series or movie, it will most likely keep me hooked. So below I listed some favorites and explained the strongest argument for watching them. One Tree Hill: You probably have heard of this show from one of it’s fan girls. However, it’s not just for the sappy women out there. I do know a few gentlemen who got hooked into it’s plot line. Here’s why. It has a growing plot line through the whole series, new characters emerge, the drama doesn’t get overboard and you get emotionally attached to each character. Dexter: This is my current series. I didn’t think I would like this show that much but after the first few episodes, I was completely drawn in and interested by the unique story line. This is so different from any other crime show you watch. It has humor, darkness, mystery, insane plot twists and a bit of romance. 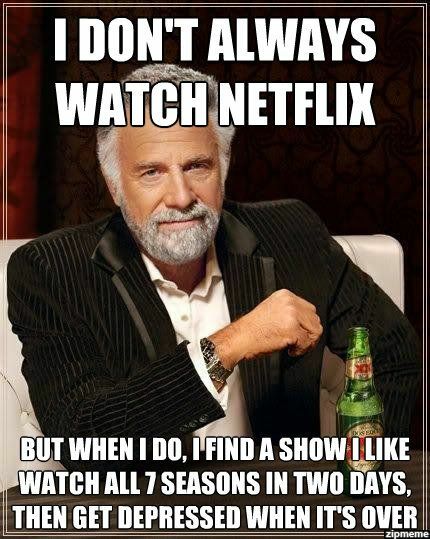 I’ve watched two seasons in one week… oops. House: If you haven’t heard of house, you’re living under a rock. This show is absolutely hilarious and constantly keeps you on your toes. In my opinion, it’s the best hospital show out there. The dark humor and mystery are great traits of this show. Every episode is a new mystery and there’s an underlying plot line that continues throughout the show. Vampire Diaries: This is one of my all time favorite shows. There is fantasy, drama, romance, mystery, and humor all wrapped perfectly into clever plot lines. The story line moves slow in some parts that makes you want to scream with the suspense but perfectly in other areas. You will always be kept guessing because there is no signs to predict what will happen next. You know how you can get feelings from shows and take a guess what is going to happen? You won’t see half of the plot twists coming. I love to find stories on my down time. I love to see stories revealed and connect emotionally with characters. Half of me feels like I am studying for my future career and half of my feels so relaxed. Finding that next wonderful series is like a treasure hunt and the listed shows are gold. Let me know your other favorites in the comments below!